This article was written in February 2002, so if you read it later (yes you do), some information may have changed in time (like Jen Haley not painting this technique). Anyway, here it is. In recent time the best painters adopted the so-called NMM-technique of painting metal surfaces. Instead of painting them with metallic colors, they paint them with normal colors, using transitions of shades to imply the impression of metallic surface. Hopefully you know many examples of NMM, just to remind you, look at anything painted by Rackham painters (for Confrontation game), or stuff painted by Bobby Wong, Jen Haley, Matt Verzani, Vaitalla and others. Oh yes, this way of painting metal is excellent, you just love it, don't you. Much better than metal painted normal way, just using metallic colors. BUT! There is still something more that can be done with painting metal. Oh, now I hear you all! How can this poor Honza criticize Bobby Wong or Jen Haley! They are the best painters in the world! All right! Yes, I agree, they are much better than me, I learn a lot from pictures of their miniatures. 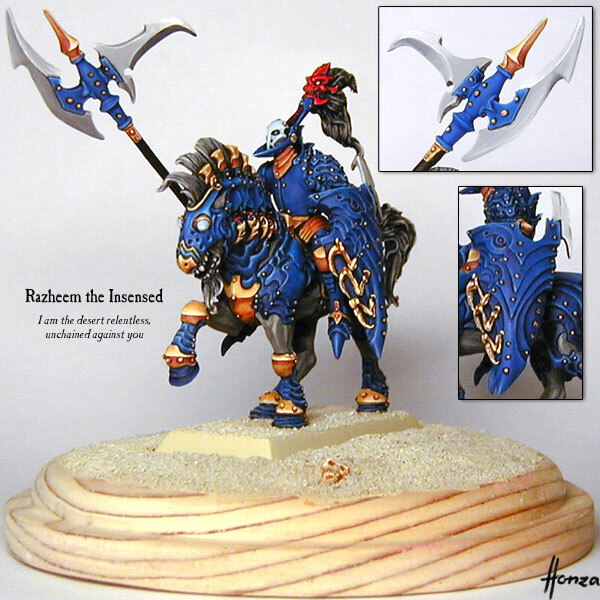 But the way NMM is painted is not right. Metal in real reflects its surroundings and there is probably no such place that would be reflected this way. Let's analyze it. They painted the minis as if the metal reflects the light the way most of the light would come from above the model and then it passes into darkest color just below the model. The reality is different. In fact there are two realities. The simpler one is indoors (but most fantasy warriors don't fight indoors), slightly more difficult is outdoors. Let's look at the outdoors, as if you can handle doing outdoors effect, you will be easily able to find out how the indoors effect should look like, in case you need it. So the basic trick is the thing that metal reflects the reality. First small distraction: if metal was to reflect its surroundings, it should reflect the trees, the houses etc. While this would be great, miniatures are usually moving along battlefield and it would not look realistic if there would be a reflection of a house painted in place it should reflect a tree. So forget about trees, forget about houses, forget about reflecting other models that appear on the battlefield etc. We have to reflect abstract surroundings. If you look to classical fantasy paintings, e.g. Boris Vallejo or Chris Achilleos, the metal reflects only hills on horizon. And this is what we are going to reflect on the metal on the miniature. Let's get even more simpler, minis do not have large areas, so probably hills would not look good, so let's just reflect plain horizon. This will be enough and will do excellent job for our purposes. If you do not have a painting by one of the painters mentioned above, just look at the front cover of 6th edition Warhammer rulebook. The horizon reflection is painted there as well. So let's get back to the theory of light. As I said, the NMM painted these days reflect the light like there was most of the light coming from top and there is a transition to the darkest shade, which is in the bottom. In reality, it is different. There is the sun, all right. The brightest thing is above you. But that's all! Around sun, there is the darkest blue sky you can find. And the darkest blue passes into lightest blue, which is on the horizon. The horizon, on the other hand, is the darkest thing of them all. And then it passes to the lightest ground, which is just at the place we stay. OK, I probably convinced you, but you might want to know, why is it so. That's because of the way the light goes. The sun is the brightest thing, because the light goes directly from it to you. 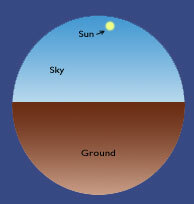 Now we look to the sky: The light has (at least) two points where it has to reflect, before it reaches your eye. It starts it's way from the sun, then it reflects from the earth ground, goes to the atmosphere, there reflects once more and reaches your eye. Now why it is darkest above you, and lightest at horizon: above you, it is the shortest way to cosmos, and so the least amount of rays reflects in atmosphere and get to you. Near horizont, this is the farest way to cosmos, the light has much longer way through atmosphere and much more rays reflects and get to your eye. The ground is bit different: the light starts it's way in the sun again, then goes to the place that you see, reflects there and goes to your eye. The amount of light that reaches your eye again depends on the distance, this time between the watched place and you. Horizon is very far, so there is the biggest chance that the light will not reach you, it will reflect in atmosphere into other direction. This is why the horizon is the darkest place. On the other hand, the light that reflects just below you has the shortest way to your eye (usually less than 2 metres). OK, so the metal should reflect that: there should be darkest line in the middle, which will pass into some mid-shade at the lowest point, and just above the horizon (the darkest line in the middle) there should be the lightest line, which then passes into about mid-shade above. And in the dark sky you can make a bright white dot (or even better small four-beam star/cross). There are three types of metal: chrome, gold and silver. Chrome reflets everything. The light does not change on the surface of the metal at all, it keeps both color and intensity. There are not many chrome metal things that fantasy/sci-fi minis carry, but if you want to do a chrome thing, then paint the sky blue, and the ground either brown or green. Other metals do reflect the intensity of light, but substitute the color for its own. Gold reflects yellow/brown, silver reflects white/grey. So when painting these metals, use the appropriate colors of the metal, but paint different shades, just as the light coming from surrounding area has. Unless the edges point really below the miniature, they should be lighter than the areas they separate. This is because the edges reflect light from much more space, not only one direction, and so much more light reflets from edge to your eye. Especially the edges that are on the top should reflect the sun, so they should be nearly white. Also edges might reflect the horizon, another very light place. So, am I the first one that made something like that? No, as I said, this thechnique is used quite a lot in classical fantasy paintings, when painting metal surfaces. Am I the first one to do such thing on a miniature? Again no, I must say, I have seen one miniature that has the horizon painted on itself. It's the miniature of Gladiator painted by Dominic Heutelbeck. But it's not so clear on this mini as Dominic painted the Gladiator as fighting inside, with reflections of windows on his armour. It looks cool but it's not so good for explanation of the theory as there are too many reflections and horizons on the mini. And very recently I have seen it also done by Scott Smith on this Scorpion halberdier. It's done perfectly on the small jagged knife that is hanging from the mini's belt. So there are examples of this done before, hopefully just nobody did it in such quantity on a single mini as I did on Razheem and I did it just like the gold is really well polished, almost a mirror, reflecting sharp contrasts. Note: as the time passed since I wrote this article, there are of course much more SE-NMM miniatures today in the world. First I have to thank to my good friend Antonin Holik, because it was his idea to do Sky-Earth NMM on a miniature. No, he does not paint miniatures, instead he is a big fan of computer graphics ray-tracing. And he works with metallic surfaces there. When he saw my first miniatures with NMM, he immediately came with the idea to do Sky-Earth NMM. We had some discussion about that, he explained me the basics behind this. Then I want to thank to the painters I mentioned in this article, ie. Rackham in-house painters, Bobby Wong, Jen Haley, Dominic Heutelbeck, Matt Verzani and Vaitalla. Their work is a great source of inspiration for me. I also want to thank to all comunity of mini-painter maillist on Yahoo Groups. And last, but not least, I want to thank Radka, my girlfriend, for all the patience and love, and that she is very tolerant to my hobby. This is a great article on fantasy painting. I have found it after my first mini with Sky-Earth NMM was painted, so this article was not the thing that helped me painting Razheem (Antonin mentioned above was the one that helped me a lot) but it explains a lot and it's really great article about painting metals.